In a German prisoner of war camp during January of 1945, Master Sergeant Roddie Edmonds of the United States Army was ordered to assemble all of his fellow prisoners who were Jewish the following morning. Edmonds, a Christian born in Knoxville, Tennessee, knew this order was likely to lead to the deaths of the Jewish prisoners, perhaps on a death march where they would quickly freeze to death, die of exhaustion, or be shot. Edmonds also knew that his failure to follow the order would probably lead to his immediate execution. Several witnesses have described what happened the next morning. When the German officer in charge angrily approached Edmonds for disobeying his order by assembling all of the prisoners instead of just those who were Jewish, Edmond retorted, “We are all Jews”. As expected, the German officer immediately took out his pistol and prepared to shoot Edmonds. I suspect relatively few Americans know how this story ends, or have even heard of Roddie Edmonds. 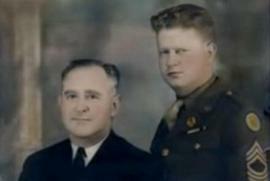 Commemorating individuals like Roddie Edmonds, who ignored their own self-interest and chose to take great risks to save the lives of others, is important because each generation learns how to interact with each other by observing the social behavior of contemporaries and learning about the deeds performed in previous generations. This includes learning both how to treat others and how others are likely to treat you. It is particularly important for Americans to commemorate individuals who have performed selfless acts of altruism for the benefit of others because regardless of what forms of media are involved, the examples of altruism our younger generations experience are far exceeded by instances of self-interested competition. Commemorating acts of altruism performed by, and directed toward, individuals from many different backgrounds around the world is particularly important in order to counteract the current trend of assuming that altruism, if it occurs at all, is only a characteristic of certain social categories of people and only directed toward members of one’s own category. The impression that humans are selfish comes from far more than the continuous media coverage of lethal violence used in the commission of robberies and other crimes. In the United States, much of the view of humans as fundamentally selfish comes from social issues being cast in the form of grievances and demands. Such demands are the antithesis of altruism even when they are more than justified and long overdue. Perhaps the only thing more obviously selfish than demanding others to give you something is the refusal to agree to such a demand. Acquiescing to demands is also no indication of altruism because it is in response to a demand and not a request. Thus, the assumption of human selfishness is reinforced regardless of whether or not those making the demands succeed. Even making demands that benefit a social category other than your own reinforces the assumption that people are not altruistic and will only make sacrifices for the benefit of others when forced to do so. Of course, people often claim to make some form of voluntary sacrifice for a political cause, but the actual sacrifice entailed is too often hard to discern compared to more readily apparent ulterior self-benefitting motives. Each time this happens the suspicion that altruism is irrelevant to the solution of social problems grow, and the message sent to young Americans becomes clearer: humans do horrible things to each other for their own benefit, and will continue to do so unless forced to do otherwise. One must always be on guard against the selfishness of others, especially when interacting with individuals in social categories other than your own. Alleged acts of altruism are particularly dangerous because they are likely to be part of a Machiavellian scheme to deceive, manipulate and exploit you. When you hear someone claim to have performed an altruistic act, you should assume that the act never actually occurred, involved no actual cost, or is being secretly rewarded. Even stories of actual human kindness that do make it into some form of media may be met with the suspicion that their use is merely a ploy to accomplish some selfish goal, such as keeping consumers from switching to a less depressing source of information. It is difficult to see this regular exposure to such a cynical portrait of human social behavior lead to anything other than future generations virtually devoid of altruism, and where individuals feel increasingly justified in selfishly exploiting others. There is, of course, the possibility that the cynical view of human behavior portrayed by media in the United States is accurate, and that transmitting such a social world to future generations is both inevitable and desirable. Before resigning yourself to this view, please consider the following admittedly naïve sounding alternative. What if altruism not only exists, but can be directed toward individuals perceived to be in a social category different from your own? To push this seemingly naïve fantasy even further, what if learning about such altruistic acts evokes both a sincere desire to engage in similar acts and, under the right conditions, actually increases altruistic behavior? If these things are true, isn’t it at least possible that the cynical view of human behavior currently being learned in the United States might be at least partially counteracted by providing young people opportunities to experience and learn about the altruistic acts of others? The goodnews is that “when any . . . act of charity . . . is presented either to our sight or imagination, we [do indeed]. . . feel a strong desire in ourselves of doing charitable . . . acts also.”1 The altruism evoked by witnessing the altruistic acts of others is not restricted to simply repaying the altruist, nor is it necessarily directed toward only members of your own social category. It even occurs when it has no chance of being rewarded. This human tendency, given the name “moral elevation”2 by psychologists, is also not limited to any particular culture,3 and has been found to facilitate overcoming some forms of in-group-out-group prejudice and racism.4 Further, this effect is not just found under experimental conditions. Altruistic moral exemplars are often one of the most frequently mentioned contributing factors reported when individuals have been asked to explain why they performed extremely altruistic acts.5 Of course, the less good news is that attempts to evoke moral elevation have to overcome the various forms of skepticism previously described. Fortunately, ways of doing this have already been partially worked out by various organizations around the world striving to inspire future acts of compassion by commemorating past acts of compassion. This single sentence anticipates and addresses skepticism of the claim that the altruistic act really happened, that it was actually costly, and that it was not compensated in any way. The sentence also makes it clear that although the acts commemorated occurred in the context of warfare, the acts themselves are not explainable as forms of competition between self-interested social categories. Instead of sacrifices of one’s life in attempts to kill members of a different category, it is the rescue of a member of a different social category that is honored. Yad Vashem also emphasizes the dramatic differences in the opportunities and costs of rescue in different countries to dissuade people from using the acts of the Righteous to assert that their own category is superior to others by virtue of producing more Righteous individuals. In addition to anticipating and overcoming skepticism regarding claims of the existence of altruistic acts, Yad Vashem and other organizations such as Holocaust museums in the United States and around the world have found ways of commemorating Righteous individuals conducive to moral elevation. Informing people of the dire consequences of an unsuccessful rescue, for both those in need of rescue and would be rescuers, increases the inspirational power of the story as well as preventing a focus on a rescue from trivializing the horrific nature of the context in which it occurred. It is also important to remind people that even the most dangerous and inspiring acts were performed by ordinary human beings who made a choice to help others that any human being could make. Tales of superhuman powers may entertain us, but superheroes make suboptimal moral exemplars because they are, by definition, capable of choosing to do things we cannot. A commemorative “garden,” either literal or figurative, is conducive to moral elevation because of its connotations as a quiet place to contemplate not only how one should behave if faced with choices similar to those faced by the individual being commemorated, but how one actually would behave in such a situation. The symbolism of planting a tree is also appropriately symbolic in many ways. It can, for example, represent the continuation of life through the descendants of even a single individual saved by a Righteous act, as well as the replication of such acts through a chain reaction of moral elevation where each act of altruism inspires the next act through its commemoration. By virtue of not being restricted to examples from the Holocaust, organizations such as Gariwo7 have additional flexibility to apply the basic concept of the Righteous in ways that can inspire altruism to potentially alleviate both local and global social conflicts. For example, Palestinians and Jews living in the intentional community of Neve Shalom/Wāħat as-Salām /Oasis of Peace in Israel have created a Gariwo garden of the Righteous. This garden provides an opportunity to view the local situation through the unique lens of Palestinians and other Arabs who have saved Jews and Jews who have saved Palestinians and other Arabs. It also places this local conflict in a larger worldwide context by honoring lesser known Righteous acts around the world such as those performed by Turks who saved Armenians. This does not mean that moral elevation is the only experience evoked by such gardens. As might be expected, the creation of a garden can also stimulate disagreements and even passionate arguments over who should or should not be commemorated, and why. However, it is at least possible that these arguments are more likely to eventually lead to agreement on solutions than to arguments. The establishment of gardens also allows local community members dealing with these difficult issues to share information about what has and has not been successful with people working towards similar goals around the world. The establishment of more Gariwo gardens and other ways of commemorating the Righteous in the United States whether through Holocaust museums, schools, or other organizations can have similar effects. Gardens can be designed to include acts of altruism, both historical and contemporary, involving the social categories (race, country of origin, religion, sexual orientation, social class, etc.) deemed to be most important by the local community. Older residents can become a source of examples of previously unknown inspiring acts of altruism, while younger residents are provided with an opportunity to be inspired by both newly discovered local exemplars and exemplary individuals from around the world they might otherwise never hear about. Connections with the creators of other Gariwo gardens can also lead to students cooperating on joint projects with students in other countries. At some point the chain reaction of moral elevation resulting from experiences at these gardens might lead to the United States joining Europe in recognizing March 6th, the anniversary of Moshe Bejski’s death in 2007, as a day when people can recognize all of the Righteous of the world, and help transform the current "European Day of the Righteous" into a "Worldwide Day of the Righteous". 1 Jefferson, Thomas. 1975. “Letter to Robert Skipwith.” In The Portable Thomas Jefferson, edited by Merrill D. Peterson, 349–351. New York: Penguin. 2 Haidt, Jonathan 2000. “The positive emotion of elevation.” Prevention and Treatment 3(1): 3c. 3 Haidt, Jonathan 2003. “Elevation and the positive psychology of morality.” In Flourishing: Positive Psychology and the Life Well-Lived, edited by Corey L. M. Keyes and Jonathan Haidt, 275–289. Washington, D.C.: American Psychological Association. 4 Freeman, Dan, Karl Aquino and Brent McFerran. 2009. Overcoming beneficiary race as an impediment to charitable donations: Social dominance orientation, the experience of moral elevation, and donation behavior. Personality and Social Psychology Bulletin 35:72-84. 5 Fogelman, Eva. 1994. Conscience and Courage: Rescuers of Jews During the Holocaust. New York: Anchor books. 6 Yad Vashem. 2018. The righteous among the nations: About the program: How to apply. "There is a linkage between deforestation, governance and peace"
"Let's build peace, justice and rights"
Who Would Risk their Life to Save Mine?